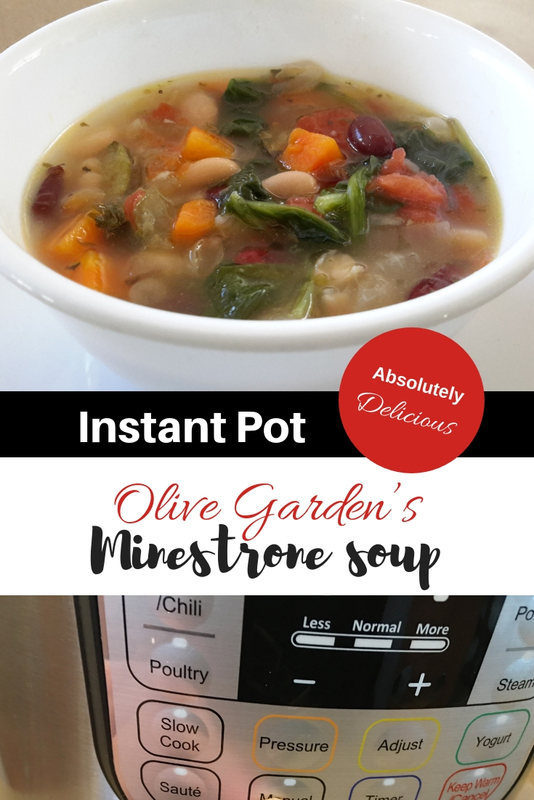 Have you ever had Olive Garden’s Minestrone Soup? It is so yummy! This hearty, healthy vegetarian soup is full of nutritional goodness. 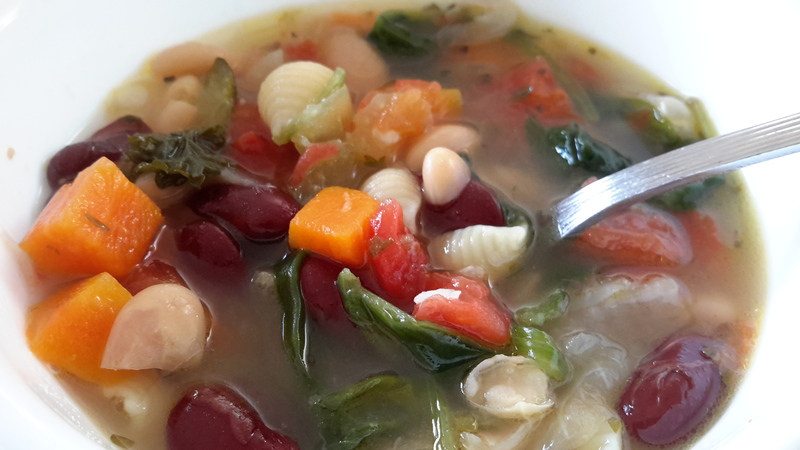 A combination of beans, vegetables and optional pasta in a yummy broth that is flavorful, but not overly spicy. 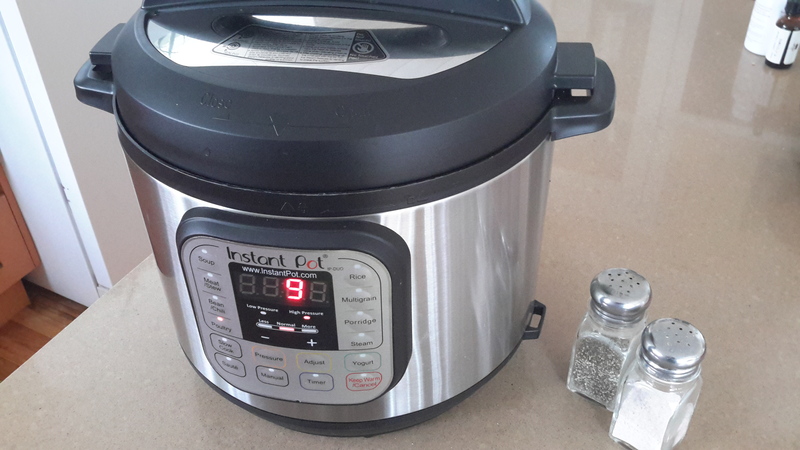 This is so easy to make, especially when using my favorite, Instant Pot or slow cooker. It can be made on the stove top as well. The other night I made this up and my son said, after his second bowl, “This is really good, even with all these vegetables.” What I love about this soup, is that you can throw in whatever you have available. I try to stay stocked up in canned beans. tomatoes and broth so it is an easy go to recipe when trying to think of something healthy and hearty for dinner. Speaking of broth. One copycat recipe stated NOT to use chicken broth, but I have made it both ways and like it both ways. This little gem has seriously been one of my best purchases! I use this almost every day. I started using a pressure cooker a few years ago and had just a stove top style. I liked it but I had to sit and babysit while stuff was cooking. This baby you just program things in and go on with your business. You can steam veggies, pressure cook, use as a slow cooker, makes beautiful rice, and can even make yogurt. I hesitated buying an electric one because they all seemed to have that nasty coating on the inside. This has a stainless steel pot. LOVE IT! Anyway, back to the recipe. 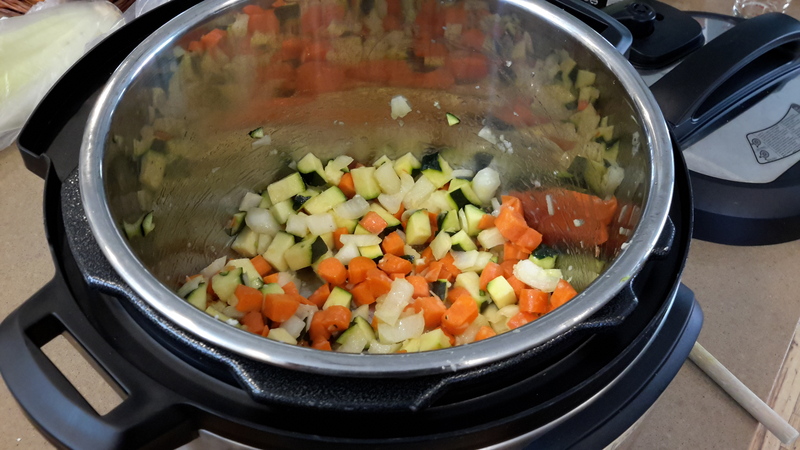 I have been tweaking a lot of recipes for the Instant Pot and here is one of them. I will show how easy it is to make both in the pressure cooker and on the stove top. One more kitchen tool I have to share with you. Now you have to know, I am not one to have a bunch of unnecessary gadgets in my kitchen. ( I don’t have room.) So the tools I do have are functional and items I use frequently. This is another one of them. It is a fruit and veggie chopper by Progressive. I use it all the time to make my Morning Muesli and to chop veggies for soups and salads. Choose the saute setting and add oil, onion celery, garlic, green beans, and zucchini. Saute for about 5 minutes or until onions begin t turn translucent. Add broth, drained tomatoes, kidney beans, carrot, water and spices. (Do not add white beans at this time). Release pressure using the “quick release” and add pasta, white beans and spinach. Put the lid back on tight, AND SIT FOR 10 minutes or so. (You don’t need to turn it back on). Saute ingredients in a large soup pot, just as described above. Add all the rest of the items and bring to a boil. Reduce heat and allow to simmer for 20 minutes or until desired consistency. Feel free to add or omit any vegetables you desire. This is a really flexible soup recipe. Use what you have available. There you have it, a wonderful, hearty, homemade satisfying and soothing soup. 3 cups water. Does not need to be hot water. directions say to add hot water, how much? Hello Pat, You add 3 cups water as indicated in the ingredients. It does not need to be hot water, sorry that is a little confusing. I will change that. Do you put the shell pasta in cooked or uncooked? It’s unclear, since it’s not really boiling again when you close up the lid. Thanks! Yes, you put the pasta in “uncooked”. I need to clarify that. Thanks for bringing that to our awareness. Enjoy your day! do you leave in on warm or off when putting in the pasta, beans and spinach? Just leave it on WARM. green beans fresh or frozen? Both will work just fine. How many calories in each serving? Thanks! I am sorry, but I don’t know how many calories are in a serving. The soup turned out very good, tasty and warm on a cold night. I used fresh cut tomatoes and it did not have much tomato taste, so I added a heaping tablespoon of tomato paste. I used whole wheat pasta and needed to let it sit a little longer. I do not like a lot of liquid in my soup, so I did not add the 3 cups of water and it is perfect for my taste. Thanks for posting, it is a very easy and flexible recipe. 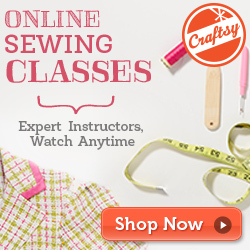 Thanks for sharing these great tips. Merry Christmas! Tasty! We have the smallest InstaPot, and all of the ingredients would not fit in it. Next time, we’ll halve the recipe. Good to know, thanks for passing on this information! I enjoyed this recipe except my pasta was still hard after 10-15 minutes. Interesting. I have never had that happen. What kind of pasta did you use, and was the lid on tight? I love this soup! I’ve made it numerous times on the stove so I decided to try my new instant pot. I loved the fact that the veggies and the pasta were done perfectly to my taste. The veggies were firm but cooked and added texture to the soup. Pasta was perfect and not mushy but a little chewieLinda. Next time I will use chicken broth instead of vegetable broth because I think chicken broth has more flavor.. 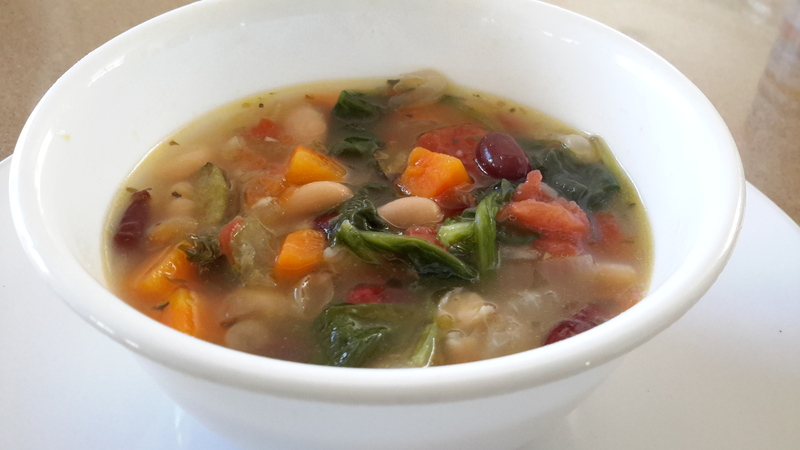 I made a “copy cat” recipe of Olive Garden’s Minestrone soup from another site a while back and someone in the comments said they used to work at Olive Garden and that if you add some Chianti to the soup it makes it taste more like Olive Garden. I did just that and it turned out amazing! Great! I will have to give it a whirl. Thanks for the tip! it says to print it is 19 pages isn’t there a shorter way? Here is the link to the print page. It is only one page. Sorry, I didn’t realize I didn’t have the link on this post. Hope this is helpful. I am currently working on getting another recipe plugin.